Landing Page Builder, the new web-based application by KMT Software, Inc., allows users to design and simultaneously publish Mobile and Desktop Landing Pages. Users can create variants of both versions and track them separately or together using practical and intuitive tools. With Landing Page Builder, users can quickly and easily create Landing Pages for email, pay-per-click, and display advertising with no design experience required. Users choose from 75 designs, make simple edits, set conversions, and create both Desktop and Mobile page variants in only a few short steps. A short demonstration video has been included above. 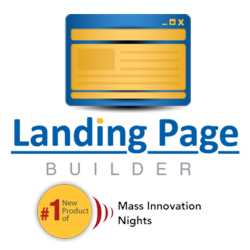 Landing Page Builder received the "Top Product" award at Mass Innovation Nights 45, a monthly product launch party and networking event showcasing new products and innovations. Every month, event guests review and vote for their favorite new products. Landing Page Builder received the most votes at the December 12, 2012 event at the Boston Globe Headquarters. Landing Page Builder is available now at KMT Software's High Impact Designer website with plans starting as low as $14/month. All of the High Impact Designer Applications, including Landing Page Builder, can be white-labeled by any company that wishes to market these services to their customer base. KMT Software was established in 1991 and currently encompasses three software brands: TemplateZone, High Impact eMail, and High Impact Designer. TemplateZone produces desktop software and is the world's leading supplier of studio quality HTML email template designs as well as exhilarating print marketing designs. High Impact eMail is an iPad Application created to allow users to design and send emails to groups on their mobile device. High Impact Designer is a suite of online marketing tools for Facebook, Email, and Landing Pages. With a community of over 2 million users, KMT Software is committed to helping small business professionals be more productive.